Located in the central areas of Chennai, RS Mahal is a large banquet complex where you can celebrate important dates like a wedding, a birthday or an anniversary. Thanks to our service you will not worry about the organization and can immerse yourself in a festive atmosphere. 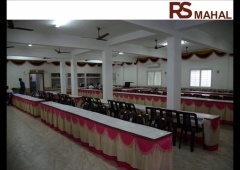 RS Mahal provides 3 banquet halls for all wedding and pre-wedding functions. For marriage receptions there is a dining hall for 150 guests. This spacious room has a traditional interior with white walls and several rows of long tables. For other functions there are 2 indoor party venues with a capacity of 200 and 400 guests. These are universal halls with a light design and a red carpet leading to the stage. We provide a professional decorator. He will beautifully decorate the room for your wedding. The big profit of RS Mahal is the ability to rent rooms. If you have guests from another city or those who are very tired, you can book 16 rooms with private facilities. Our affordable prices will delight you. RS Mahal is the worthy party place to start your family history right here!